Computations were performed for the reaction of 1 and 2 with C60 at M06-2x/6-31G(d)//M062x-3-21G*. The reaction can occur with the dienophile being either ring 1, 2, or 3 of pentacene and ring 1, 2, 3, or 4 of bistetracene. They located TSs and products for all of these possibilities. Select TSs and products are shown in Figure 1. For the reaction of 1a, the lowest energy TS is for the reaction at the central ring (ring 3), and the resulting product is the lowest energy product. The transition state (PT_TS3) is shown in Figure 1. 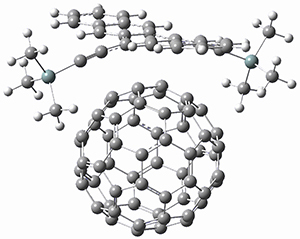 This TS has the least distortion energy of the three possibilities, because reacting at this central ring destroys the least amount of aromaticity of pentacene. For the reaction of 1b, the lowest barrier is again for reaction of ring 3 (through TMSPT_TS3). However, the product from the reaction with ring 2 (TMSPT_P2) is lower in free energy than TMSPT­_P3, likely caused by steric interactions with the silyl substituents. This actually matches up with experiments which indicate that an analogue of TMSPT_P2 is the kinetic product but TMSPT_P3 is the thermodynamic product. Figure 1. M06-2x/3-21G* optimized geometries. 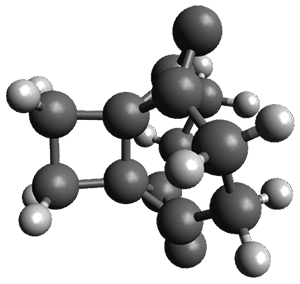 The computations involving the Diels-Alder reaction of C60 with either 2a or 2b come to the same conclusion. In both cases, the lowest barrier is for the reaction at ring 2, and the product of the reaction at this same ring is the only one that is endoergonic. The geometries of BT_TS2 and BT_P2 are shown in Figure 1. More importantly, the barrier for the Diels-Alder reaction involving 2a and 2b are at least 6 kcal mol-1 higher than the barriers for the reaction of 1a and 1b, in complete agreement with experiments that show little reaction involving analogues of 2b with C60, while analogues of 1b are reasonably rapid. 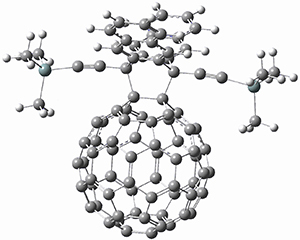 (1) Cao, Y.; Liang, Y.; Zhang, L.; Osuna, S.; Hoyt, A.-L. M.; Briseno, A. L.; Houk, K. N. "Why Bistetracenes Are Much Less Reactive Than Pentacenes in Diels–Alder Reactions with Fullerenes," J. Am. Chem. Soc. 2014, 136, 10743-10751, DOI: 10.1021/ja505240e. The Journal of Chemical Physics has produced a Special Topics issue on Advances in Density Functional Theory. I want to call to your attention the Perspective article by Becke titled “Perspective: Fifty years of density-functional theory in chemical physics”.1 Becke writes a personal account of the history of DFT and makes a number of interesting points and observations. He rightly notes that DFT is exact and we should more properly refer to our actual implementations as Density Functional Approximations (DFA). He also notes that use of the term ab initio as a synonym for wavefunction theory is inappropriate as DFT is just as ab initio as HF and post-HF theories. A common perception about DFT (well, DFA) is that there is no way to systematically improve functionals. Becke exposes a true underlying logic that has driven much of DFA development. Lastly, Becke is discouraged by the more recent developments that have included virtual orbitals, such as double hybrid methods. His approach is that true DFT is occupied orbitals only (for which he pointedly does not want to adopt the acronym OOO), and that developments that include the virtual orbitals might toll the “death knell” for DFT. For those interested in a pretty accessible account of the history of DFT, Becke’s Perspective is an excellent place to get started. (1) Becke, A. D. "Perspective: Fifty years of density-functional theory in chemical physics," J. Chem. Phys. 2014, 140, 18A301 DOI: 10.1063/1.4869598. 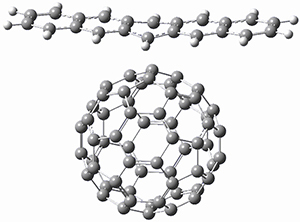 Kozuch has now examined this rearrangement in more detail, to see if 1 is really stable.1 The issue he raises is the role of quantum mechanical tunneling – since the distance that the carbon atoms need to move in reaching the TS is rather small, perhaps heavy atom tunneling might manifest. In the absence of tunneling, conventional variation transition state theory (CVT) predicts that the half-life of 1 is 170 s at 75 K, and longer still at even lower temperatures. However, the situation is radically different when tunneling is included. Accounting for tunneling using the small curvature tunneling (SCT) approximation predicts a half-life of 1.6 x 10-3 s at 75 K and only a minimally longer half-life of 4.6 x 10-3s at 10 K. Thus, Kozuch concludes that 1 is not stable at any temperature! One should thus be cautious in applying the term “stable” to a compound that might be quite strained and susceptible to tunneling. Figure 1. B1B95/6-31G(d) optimized structure of 3. 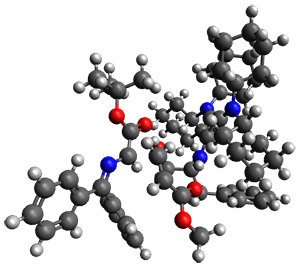 1) Kozuch, S. “A Quantum Mechanical “Jack in the Box”: Rapid Rearrangement of a Tetrahedryl-Tetrahedrane via Heavy Atom Tunneling,” Org. 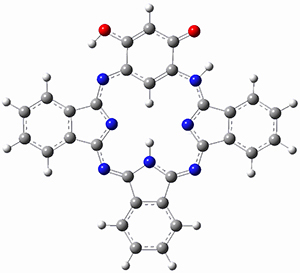 Lett., 2014, 16, 4102-4105, DOI: 10.1021/ol5017977. Readers of my blog know that I am an advocate for Open Data, whereby scientists permit the widespread distribution of data without restrictions. Data should be available to anyone at any time at no cost without any legal (i.e., copyright or IP) restrictions. This will enhance our abilities to follow up on research and reuse the data in whatever way we wish. In particular, reuse of data should be seamless and lossless. I have noted many times that Supporting Materials in today’s journals is far from ideal. Often authors do not include data at all! Sometimes the data is corrupted, especially if data is being deposited solely through pdf, which involves the loss of almost all semantic information about the data. Unfortunately, very rarely is data deposited in a form that is readily reusable. For example, I make use of 3-D coordinates of molecules for this blog, and these are invariably deposited as simply text within a pdf. I then have to copy-and-paste this data into a new file formatted for use in some molecular viewer of my choice (for me, typically GaussView or Avogadro). The leader in advocating and demonstrating chemical data reuse is Henry Rzepa (see his blog for many examples). He and his group have published a paper describing a system for separating data from the paper narrative – a process they call data emancipation – as part of the scientific publication process.1 I strongly encourage readers of this blog to take a look at this paper for the publication model they propose that places data at the nexus of the scientific process and makes it available for widespread reuse. Take a look at the web enhanced objects, such as this one (you might need a subscription to access this, but this link takes you to the Figshare site which is open), to see how data can be deposited for search, retrieval, and direct reuse. This is a model I hope many computational chemists will adopt. We also need to advocate with journal editors and publishers to establish similar procedures for all manuscript submissions. (1) Harvey, M. J.; Mason, N. J.; Rzepa, H. S. "Digital Data Repositories in Chemistry and Their Integration with Journals and Electronic Notebooks," J. Chem. Inf. Model. 2014, ASAP, DOI: 10.1021/ci500302p. 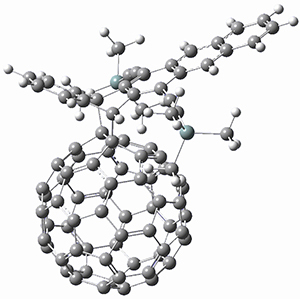 Clark and co-workers have examined small fullerene clusters for their ability to capture electrons.1 They first looked at the fullerene dimer, comparing the electron affinity of the dimer having a C-C bond between the two cages (about 1.6-1.7 Å between the two cages) 1 and where the two cages are interacting only through van der Waals attractions (around 2.6 Å) 2. 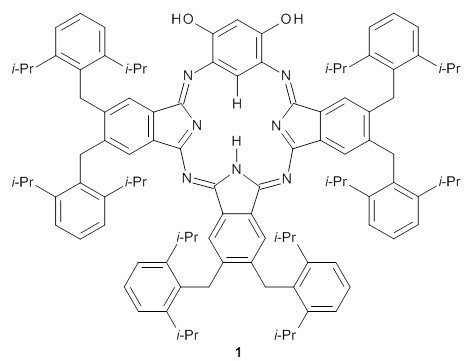 The structures and their radical anions were computed at RI-BP86/TZV. The structures of the two radical anions are shown in Figure 1. Interestingly, the radical anion of 2 is actually lower in energy that the radical anion of 1. Comparisons with some other methods are discussed, including a CASSPT2(5,4)/ANO-L-VDZ, computation, that support this result. Figure 1. 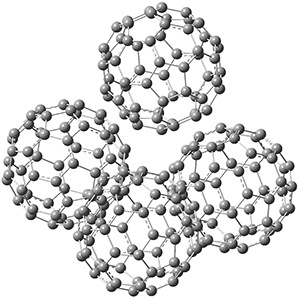 RI-BP86/TZV optimized geometries of the radical anions of 1-4. This suggests that the added electron is being held between the cages, in an interstitial region. That suggested looking at the trimer and tetramer structures 3 and 4. The radical anions of these two oligomers are also shown in Figure 1. 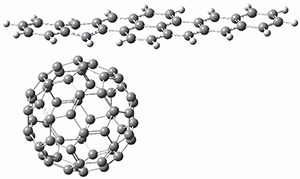 These oligomers show electron affinities of 1 eV greater than for fullerene itself, along with the ability to stabilize the dianion and even the trianion, what the authors call “deep electron traps”. 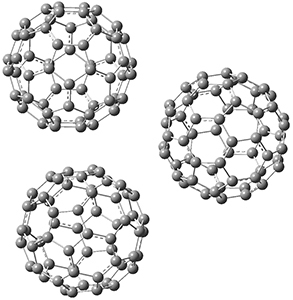 (1) Shubina, T. E.; Sharapa, D. I.; Schubert, C.; Zahn, D.; Halik, M.; Keller, P. A.; Pyne, S. G.; Jennepalli, S.; Guldi, D. M.; Clark, T. "Fullerene Van der Waals Oligomers as Electron Traps," J. Am. Chem. Soc. 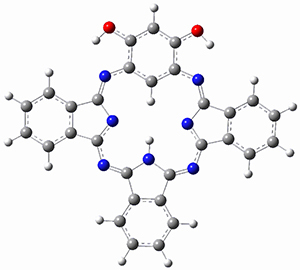 2014, 136, 10890-10893, DOI: 10.1021/ja505949m. Computational techniques are gaining some traction in helping to understand enantioselective organocatalysis. I talk about a few examples in Chapter 6.3 of my book. 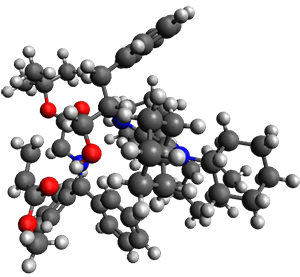 Lambert and Vetticatt have now used computations to help understand the role of the catalyst 4 in the Michael addition shown in Scheme 1.1 This reaction proceeds with 99% yield and an ee of 98%. 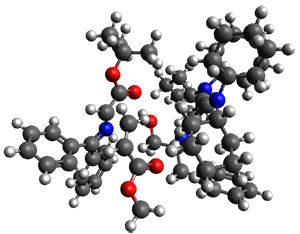 13C kinetic isotope effect studies suggest that the rate determining step is the C-C bond formation (the Michael addition step) which follows the deprotonation of the imine 1 by the catalyst 4. 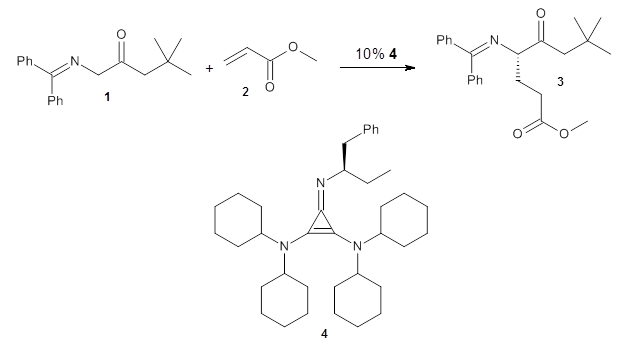 They performed ONIOM computations to search for transition states of this rate limiting step for the reaction in Scheme 1, using the full molecules. 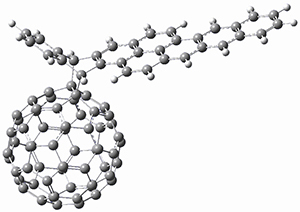 From this ONIOM search, the energies for all transition structures with 5 kcal mol-1 of the lowest energy structure were then obtained at B3LYP/6-31G*. The three lowest energy TS are shown in Figure 1. The two lowest energy structures lead to the major enantiomer, while the third lowest energy structure leads to the minor enantiomer. These energies lead to a prediction of an ee of 92%, in reasonable agreement with the experiment. The computed kinetic isotope effects are in nice agreement with experiment, supporting this step as the overall rate limiting step. Table 1. 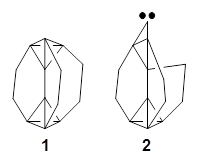 ONIOM optimized geometries of the three lowest energy TSs. Relative energy (kcal mol-1) in parenthesis. I agree with this sentiment, pessimistic as it may be. Answering this type of question is likely to remain very challenging for years to come. 1) Bandar, J. S.; Sauer, G. S.; Wulff, W. D.; Lambert, T. H.; Vetticatt, M. J. "Transition State Analysis of Enantioselective Brønsted Base Catalysis Chiral Cyclopropenimines," J. Am. Chem. Soc. 2014, 136, 10700-10707, DOI: 10.1021/ja504532d.